Paddy Power is Ireland’s largest and best known bookmaker. Over recent years it has come to be known for offering fantastic odds and its quirky advertising campaigns. Paddy Power operates a series of betting shops throughout Ireland, Northern Ireland and Great Britain as well as its telephone and online betting services. Unsurprisingly as an Irish bookmaker Paddy Power focuses on horse racing and football. However, it is possible to bet on a huge number of sports including: American Football, Athletics, Australian Rules Football, Badminton, Baseball, Beach Volleyball, Bowls, Boxing, Chess, Cricket, Cycling, Darts, eSports, Fishing, Futsal, Gaelic Sports, Golf, Greyhound Racing, Handball, Hockey, Horse Racing, Indoor Soccer, Motor Racing, Netball, Pool, Rowing, Rugby League, Rugby Union, Show Jumping, Snooker, Soccer, Squash, Swimming, Table Tennis, Ten Pin Bowling, Tennis, UFC, Virtual ports, Volleyball and Waterpolo. Furthermore, Paddy Power is known as being the best place to find novelty bets. They offer bets on a huge range of television shows, political events, current news items, awards and much more. Paddy Power offers Live Betting on a huge range of sporting events. From football to snooker to tennis there are always odds on offer which develop as the games progress. What makes Paddy Power extremely convenient is the live streaming of games. Not only can you keep track of the odds, but in many cases you can watch the game live on your computer. If for some reason you can’t watch the game, then Paddy Power’s ‘Commentary’ section is a great alternative. Punters at Paddy Power can listen to live commentary on Horse Racing, Greyhounds and Football. Furthermore, there are even text commentaries for times when you are unable to listen. Paddy Power offers custom designed apps for iPhone, iPad and Android. There is also a mobile version of the website which can be accessed by any device with an internet connection. The three apps all offer the same features, but are customised to the device. The apps are extremely robust and offer complete control over your account. All the latest odds are available and it is also possible to enjoy the live streaming events. If a major sporting event is approaching then Paddy Power takes mobile betting one step further. The bookmakers will often develop a special app just for the event. For instance when the Cheltenham Festival takes place, Paddy Power releases an app which offers a countdown to each race, a daily tip and special offer and exclusive updates from the racecourse. There are two aspects of Paddy Power which really make it stand out from the crowd; novelty bets and special bets. For instance Paddy Power often runs special ‘Justice’ bets where the bookmaker pays out not only for the actual result, but for what they think should have happened as well. The novelty bet market at Paddy Power is absolutely huge. There are normally over 200 novelty markets available at any given time. As well as being able to bet on the latest TV shows, awards and political events ,there are also markets available such as ‘Pope Specials’, ‘Nobel Prizes’ and ‘Julian Assange Betting’. Paddy Power takes real pride in offering fast and effective customer service. Upon visiting the ‘Help Centre’ on the website there is a very clear and easy to navigate FAQ. For any queries that need a more detailed response, the customer support team is available around the clock via phone, email and live chat. There are Freephone numbers for the UK and Ireland as well as an international help line. Paddy Power displays it’s ‘Average Response Time’ on the website, at present the average for calls is 21 seconds, live help 39 seconds and just over two hours for email queries. Banking at Paddy Power is slightly limited in that it only accepts GBP and the Euro. However, they offer a huge range of banking methods. Deposits can be made via debit and credit cards, cash, PayPal, Skrill, UKash, Neteller, PaySafeCard, PayByMobile, bank transfer and cheque. The majority of deposit methods are immediate and there is a minimum deposit of £5. A similarly comprehensive list of withdrawal methods is available. Most of them will process the transactions within four hours and a minimum withdrawal of £10 is required. For all UK and Ireland based punters WhoIsTheBestBookmaker.co.uk believes that Paddy Power is a fantastic betting destination. Those from elsewhere may find the focus on football and horse racing slightly restricting; however, excellent betting markets are available on a huge range of sports. 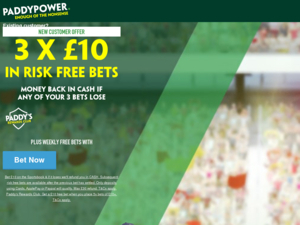 Thanks to its novelty markets and special offers Paddy Power really feels like it has a bit more to offer than other bookmakers and makes it a really fun place to place a bet.